It's been a month since FedEx dropped off a box that would kick start my health and weight loss journey: inside was a blue Fitbit Alta. I jumped headfirst into the aspect I was most excited for: competitions challenges, and surprised myself by taking advantage of other features I didn't expect to: food and water tracking. Challenges: If something is winnable, you better believe I plan to win. Let someone out walk me? No thanks. Whenever I get a push notification that someone else is creeping up on me, I get up and walk. Colleagues of mine report the same effect as one has even admitted to walking in place in the shower (with her arm outside, don't get your tracker wet!) to catch up to my step count. 7 Day Steps: As I generally participate in challenges with the same group of people, results become predictable after awhile. 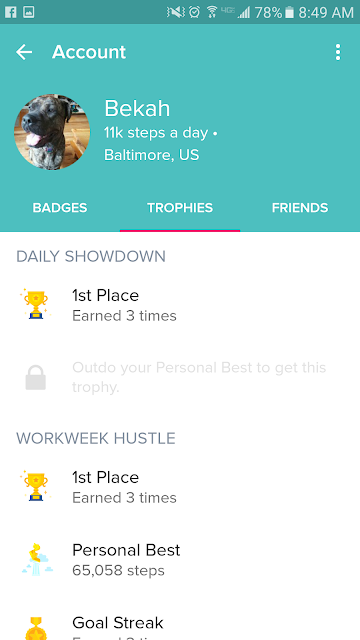 7 day steps lets me compare my overall activity to all of my Fitbit friends, not just the few in a given challenge. 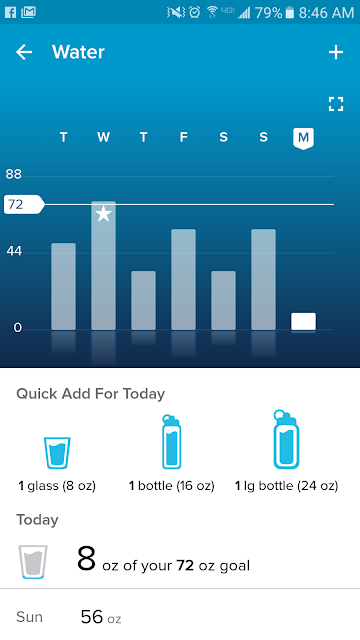 Water Tracking: I thought I wouldn't use this as I know I drink a lot of water, but this has been more helpful than I expected. It's nice to visually see and track (was this my 3rd or 4th bottle this morning?) my progress each day, and it's a motivator for days where I'm slacking and don't realize it. I drink water all day at my desk, but on the weekends I easily forget. It really comes in handy then. Food Tracking: I know "you can't outrun a bad diet," but food tracking sounds like torture to me and I rarely keep up with it. I decided to try it anyway since a neighbor who took full advantage of this feature reported losing 30 lbs. The first week was a sobering challenge, but it helped me to see the things that were hurting me and plan my meals and snacks ahead for the workweek (weekends are another story, we all need little indulgences!). I still track, though not as thoroughly, now that I have a better grip on what a healthy day should look like for me. Onto the fun part—1 month benefits/progress! Choosing to move more has benefited me with increased energy and focus. Most days, I walk a mile (at least) at lunch and another mile with Anise when I get home...which means, she is also winning here as she gets more exercise (I've also lengthened her "short" walks)! In addition, moving around more has affected my mental health as I have, for reasons beyond my understanding, registered my first 5K (involving running—I've walked one, but I'm suddenly encouraged to challenge myself a little more)! Moving more has encourged me to incorporate other fitness back into my lifestyle like slowly training to run (I've just begun couch to 5K) and some Tone it Up workouts at home. Overall weight loss hasn't been huge, but it's only been a month, and the number is going down instead of up so I am content: since starting to use Fitbit, I've lost 4 lbs.! Can't wait to see how the next month goes. Any fellow Fitbit users out there? How's it going? Feel free to friend and challenge me! I recently upgraded my fitbit to the charge HR and am absolutely loving it! I love my FitBit! My whole family has them and we are in a Workweek Challenge right now! It's been raining here so I haven't been able to walk outside at night, but my parents have a treadmill so they're beating me and it is killing me!! I might need to walk laps around my living/dining rooms tonight!